One of my favorite hymns is a song that is sung quite often at my church. The name of it is Take My Life And Let It Be. It was written by Frances Havergal on February 4, 1874. 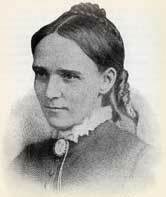 "I went for a little visit of five days," wrote Frances Havergal, explaining what prompted her to write this well-known hymn. "There were ten persons in the house; some were unconverted and long prayed for, some converted but not rejoicing Christians. [God] gave me the prayer, 'Lord, give me all in this house.' And He just did. Before I left the house, everyone had got a blessing. The last night of my visit I was too happy to sleep and passed most of the night in renewal of my consecration, and those little couplets formed themselves and chimed in my heart one after another till they finished with "ever only, all for Thee!" One of the most dedicated Christian women of the nineteenth century, Frances was the youngest child of a Church of England minister. Though she was always in frail health, she led an active life, encouraging many people to turn to Jesus and others to seek a deeper spiritual walk. Frances had begun reading and memorizing the Bible at the age of four (eventually memorizing The Psalms, Isaiah and most of the New Testament). At seven she wrote her first poems. Several of her mature verses became hymns. In addition to "Take My Life," she wrote such favorites as "I Gave My Life for Thee," "Like a River Glorious," and "Who Is on the Lord's Side?" Because her voice was lovely, Frances was in demand as a concert soloist. She also was a brilliant pianist and learned several modern languages as well as Greek and Hebrew. With all her education, however, Frances Havergal maintained a simple faith and confidence in her Lord. She never wrote a line of poetry without praying over it. One of the lines of Take My Life And Let It Be says, "Take my silver and my gold; not a mite would I withhold." In 1878, four years after writing this hymn, Miss Havergal wrote a friend, "The Lord has shown me another little step, and, of course, I have taken it with extreme delight. Take my silver and my gold now means shipping off all my ornaments to the Church Missionary House, including a jewel cabinet that is really fit for a countess, where all will be accepted and disposed of for me. Nearly fifty articles are being packed up. I don't think I ever packed a box with such pleasure." Jesse Noland was born on August 22,1799 at Sinking Creek, North Carolina, the youngest son of George and Martha Crouch Noland. 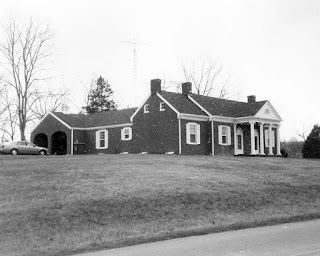 After George died in the late 1790's, Martha married Isaac Denton and, like others from Washington County, they soon migrated east to a new land that had just opened up in Kentucky. They settled at a place known as Stockton's Valley. Isaac and Martha helped organize the first Church at Stockton's Valley. Brother Denton was the pastor of Clear Fork Baptist Church until his death on January 26,1848. Martha died less than a month later, on February 22,1848. On August 14,1825, Jesse married Matilda Kendrick. They had eleven children. The Jesse Noland home on Highway 969 at Spring Creek was built between 1822 and 1828. At the time of its completion in 1828, the home was one of the most elegant and uniquely designed buildings in the region. In an era where most of the population's dwellings were made out of wood framing or logs insulated with clay, the Noland home was built by brick, signifying Jesse Noland was a wealthy person. Actually, in 1837, he was reported as one of a dozen persons having the largest tax valuations. Jesse Noland died February 13,1857. On September 20,1886, Matilda agreed to pay her children, except Jesse Harrison Noland, $1.00 for her deed to all her land and real estate holdings to Jesse Harrison Noland. In return, Jesse Harrison agreed to pay off all money owed on the properties and support his mother for the rest of her life. This agreement was recorded October 9,1886. Matilda died May 1,1899. In 1927, Jesse Harrison Noland was recorded stating, "In consideration of the traveling public and my neighbors, I hereby give to the County of Clinton and the State of Kentucky, for the sole use as a public road and a bridge site, the following described property." The property spanned from the center of Spring Creek at the north all the way south to the Tennessee line. It was twenty-five feet wide and became the road that is now U.S. Highway 127. 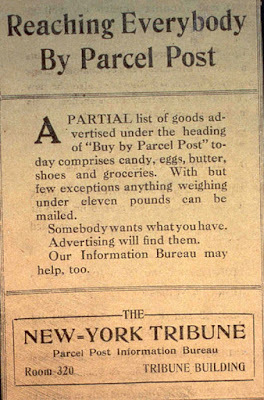 The deed was signed on January 4,1927. Jesse Harrison Noland retained the house and land, said to reach more than four miles, until his death in 1929. Jesse Noland and two of his sons, William and John Kendrick are buried at Clear Fork Cemetery. 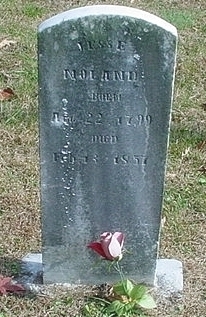 Jesse Harrison Noland is buried at Maupin Cemetery. His grave marked with a five foot carved white marble marker. The Jesse Noland property was sold in 1929 to J. Porter Poore. In 1947, the property was sold to the Hershel and Willie Sawyers Cross family. In 2001, the property was sold to its current owner, Jeff Thrasher, of Miami Beach, Florida and formerly of Albany. After I wrote and published this story, I received an e-mail from someone that read, "according to a Noland descendant, Jesse Noland died of pneumonia after he helped remove water from the basement of his home after it was flooded." For more about the Jesse Noland home, visit the National Register of Historic Places. A casinghead gasoline explosion that occurred September 27, 1915, at Ardmore, Oklahoma, was the deadliest and most destructive of any up to that time. Casinghead gasoline, or natural gasoline, is collected from natural gas at the casinghead of an oil or gas well. Casinghead gasoline production held an important place in Oklahoma's early petroleum development, and by 1913 forty natural gasoline plants existed. Placing the gas under high pressure converts the gasoline in it to a liquid state, but this extremely volatile substance must stay at around 50F or it will expand and change back to a gaseous state. The product was generally shipped to refineries by rail. On September 26, 1915, a railroad car carrying casinghead gasoline arrived in Ardmoreat the Atchison, Topeka, and Santa Fe Railway depot. There the car was left until it could be taken to a nearby refinery. The next day the temperature quickly rose, activating the car's pop-off valve, designed to release gas pressure. Gas began to pour out and into the low-lying areas of downtown Ardmore. The train conductor refused to move the car because of a fire at a nearby asphaltum plant. The Ardmore Refining Company then sent a representative, who removed the dome from the top of the car, filling the air with gas and vapors. At 2:20 p.m. on September 27 an explosion, triggered by an unidentified source, destroyed most of downtown Ardmore. Many people were injured, and forty-three people were killed. A district grand jury and a local coroner's jury found the Santa Fe Railway at fault. Citizens formed a committee that took claims and then presented them to the railroad officials. More than seventeen hundred claims were filed, and $1.25 million was paid. The attorney responsible for the settlement of these claims was a native of Clinton County. His name was Samuel Thomas Bledsoe. Samuel Thomas Bledsoe was born in Clinton County on May 12, 1868, the son of Elijah and Ottilla G. Snow Bledsoe. After attending some school in Clinton County, he was enrolled in a private school at Jamestown, Kentucky, and later, the Southern Normal School and Business College at Bowling Green. He also studied law under the direction of Tom Brown of Brown and Bliss, Sherman, Texas, who later became Chief Justice of the Supreme Court of Texas. Bledsoe attended the University of Texas in 1888 and 1889. He taught school in Clinton County in 1885 and in Cumberland County in 1886. He moved to Grayson County, Texas in 1887. In 1890, he was admitted to the practice of law at Sherman, Texas. On May 1, 1890, he moved to Ardmore, Indian Territory, and began practice of law there. And, on July, 1912, was appointed General Attorney of the Santa Fe at Oklahoma City. Although there was grave doubt of the Santa Fe's responsibility for damage resulting from the explosion, that Company on Bledsoe's recommendation offered to assume liability to all claimants who would agree to submit their claims to arbitration by a Committee of Ardmore citizens to be selected by the Mayor of Ardmore in case they were unable to agree with the Company as to the amount to be paid. Notwithstanding there were many hundred claims, only one suit was filed, the claimant recovering much less than he had been offered. Samuel Thomas Bledsoe died on March 8, 1939 at Chicago, Illinois. *From Chronicles of Oklahoma - Vol. 17, No. 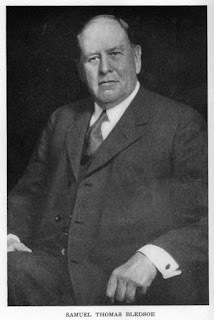 2, June 1939 - Samuel Thomas Bledsoe, by M.L. Lyles. "It is the perfect place to settle," is what Thomas Stockton must have thought when he was the first to arrive here in 1798. Stockton had built one of the first grist mills in the Smokey Mountain area of Tennessee, but when the new land east of the Green River opened in Kentucky, he packed up and headed north. As he crossed over Cumberland Mountain and stood on a spur of that elevated platform, later to be called Poplar Mountain, he surely must have been overwhelmed at the beauty of what lay before him...an area he named Stockton's Valley, later to be known as Albany. There has never been a shortage of heroes in Clinton County. Many of the first residents of Stockton's Valley were young adults. Most were either soldiers of, or sons and daughtes of soldiers of, the American Revolution. They were just a few short years removed ancestors who were of french, english, irish or german descent. They were proud to be Americans and they were eager to begin new lives in a new territory. It was the fall of the year when the call for volunteers went out at the outbreak of the War of 1812. Because of their background, there was no question that residents of Stockton Valley would be first in line to eagerly take up arms to defend their country once again. On August 31, 1813, Company 53, led by William Wood of Stockton's Valley, reached Newport, and the company's 47 men, including 36 rank and file, 11 commissioned officers and nine rifles, prepared for battle as they crossed the Ohio River at Cincinnati, and headed for Lake Erie. On October 5, 1813, General Harrison and his forces crossed over into Canada where they fought and won the decisive Battle of the Thames. It is said William Wood was present when Richard M. Johnson killed Tecumseh. The soldiers of Stockton's Valley returned home on November 13th. They had left their home and families to defend their country, and had returned as heroes. There are many other heroes in Albany and Clinton County; farmers, teachers, business leaders, pastors and Church folk, and every single one of them have done their part, or are still doing their part to make our little community what it is today....a great place to grow up and live and raise our children. And, while some are called to leave home and make their mark somewhere else in the world, they are still proud to call Albany and Clinton County home. I proudly salute those who have come before us, and those who are still out there doing what they do every day to make my town the GREAT place that it is today. 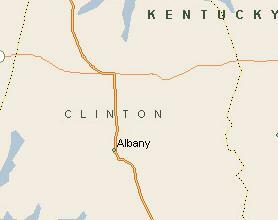 Clinton County was formed on February 20, 1835. By the year 1880, 7,212 people were living here. The population in 2010 was 10,272. When I was growing up, there was a large sign out by the hospital that read: "Welcome to Albany - Home of 2,000 Friendly People. The fact that the increase hasn't been so great is not what matters. While the faces of people may come and go, what counts is there is always going to be plenty of 'friendly' people around. James Parrett's family migrated across the Cumberland Plateau when he was only a child. His father had died when James was only two years old. James caught the measles during the migration. His widowed mother left him with another family in order to keep her other children safe from the terrible disease, and before she could return for James, she died. As a young boy, James was made an indentured servant, which means he worked under contract for someone in exchange for food, clothing, lodging and other necessities. Eventually, he grew to be a man, with a dark complexion, dark hair, hazel eyes and he stood 5'10". 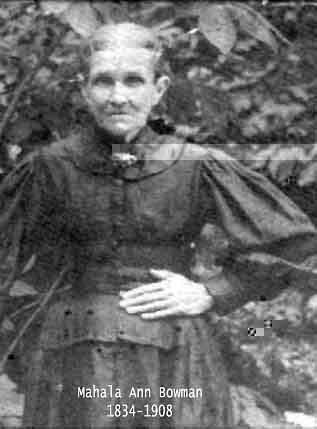 In the 1850's, James married Mahala Ann Bowman in Overton County, Tennessee. On November 27, 1862, James enlisted in the Civil War. He joined Company H of the 28th Tennessee Infantry at McMinnville and achieved the rank of Sargent. A collection of letters that James wrote to Mahala during the war were handed down over the years and eventually became the property of Doris Parrett Williford, James and Mahala's great-granddaughter. The letters chronicle the inner struggles James experiences while being away from his wife and children during the war, and how he uses his faith to see him through the ordeal. Gary Norris transcribed the letters and they were posted online. In his transcription, Gary included James' misspelled words alongside the correct spelling. For the sake of space, I have only included the correct spelling. In some instances, I put a sentence in proper order only for the sake of allowing the sentence to make sense when reading it. Photos courtesy of Dale Welch of Monterey. Written just after the Battle of Murfreesboro, Tennessee on December 31, 1862 and January 1, 1863. James takes the opportunity to tell Mahala Ann Parrott he had survived the battle and missed the entire family. Already the Confederates were taking up defensive positions between Shelbyville and Tullahoma. This defensive line was called the Duck River Line. It would hold the Union forces in check until June 1864. I want to use the opportunity to write to you to let you know that I am well and I hope you and all are well. I got to my regiment on the second day after I left home. I found it on the battle field about three miles of Murfreesboro. We are now north of Shelbyville and Tullahoma. There has been a terrible battle here. I want to see you so very bad but no telling when I can. Do the best you can. If you have the opportunity, write to me. Write every chance you have. I dont know when I can come home. Kiss for me, my babies. At the time of this letter, the Confederate Army of Tennessee is sitting on a defensive posture on the Duck River in Middle Tennessee. Apparently, James had either been wounded or was recovering from illness. Rome, Geogia was a rear hospital area or the Confederate Army of Tennessee. At this time Mahala Bowman Parrott was still protected by General Bragg's Army of Tennessee. By the first of July the Confeferates were in retreat and all of Middle Tennessee was surrendered to the Union forces. After that point, it would be a deadly process for James to attempt to visit his wife in the Upper Cumberland area. I now seat myself to write you another letter to let you know that I am well but not stout. I am weak yet, but I can eat every hour in the day. If nothing happens to me, I will be able to go to my command in another week. I have had a hard time of sickness, but thank God I am well now and when this letter comes to you I hope it will find you all well and doing well. I want to see you worse than anybody on earth. Nobody is now company for me. You and your little boys is on my mind continually. I pray to God that the time will soon come when I will get home to you in peace. Hala Ann, I love you better than anybody in this world. I want to see you and kiss your sweet lips in token of my kind of love to you. I never knew what trouble was until I left home. We lived together eight years, lacking one day, and a happy life we lived. It melts my heart to think that such lover as us has to be parted in such a manner as we are. A many a tear I have shed since I left home. I want you to pray for my return home soon, and if we never meet again on earth, I hope we will meet in Heaven, where parting will be no more; no wars nor sickness, nor trubbles never come. Pray for my future welfare. The prayers of the righteous [availeth] much. Do the best you can till I get home. I don't now when I can get to come home. They won't furlough nobody, but I am to come to see you if nothing happens sometime between this and fall. Furlough or not, for it don't seem to me that I can stand it much longer without seeing you and the boys. I think this year is the last year of the war. I think that we will have peace. People is geting tired of this war on both sides as the cotton famine is great in England and France. So, that France and England will recognize the south independence. I want you to watch the office at Goodbars. 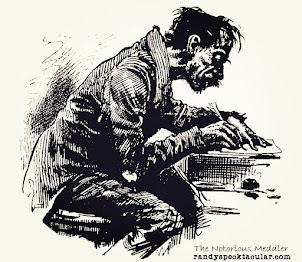 I direct my letters to the Goodbars, but the mail stops at Gillilands but Goodbars goes there after his newspapers and he will bring all letters to his house. I have wrote you three letters since I have been in Georgia, and have not no answer as yet. I received our letter that was dated the 24 of February. It came to the regiment and I wrote to Jerry if any letter had come from you to send them to me and he sent that letter to me. I was glad to hear from you, to hear that you was all well. It was all the news that I have heard from you since I left home of consequence. I want you to write to me every chance you have. I dont know where to tell you to send your letters. Until I go to the camps you can't answer this letter. Before I leave here, I watch the office for [an] answer from the last letter that I wrote you. I wrote for you to write in haste but use every chance you have to send them by hand. On November 27, 1862, James Parrett enlisted in the Civil War. He joined Company H of the 28th Tennessee Infantry at McMinnville and achieved the rank of Sargent. A collection of letters that James wrote to his wife, Mahala, during the war were handed down over the years and eventually became the property of Doris Parrett Williford, James and Mahala's great-granddaughter. The letters chronicle the inner struggles James experiences while being away from his wife and children during the war, and how he uses his faith to see him through the ordeal. When you write, write everything that you think will comfort me. Write all about affairs so I may know how you are geting along. If you are not out of money, be saving of it. I want to send you some money the first chance if it would come to you safe. I would send you some money in this letter but I am ____ to risk it. I have a pretty [gift] for you and Lety, one apiece. I will send them to you the first chance. Mahala Ann I have you a fine hymn book. I will send it to you the first chance. The book cost two dollars. The other pretties are two silver thimbles warrented to be silver. The two cost me three dollars. Things is plenty here but at a high price. Shoes for women, fine shoes, they ask $20.00 a pair. Every thing is [an] awful might higher now. I will give you the prices of produce: sweet potatoes are five dollars a bushel, irish potatoes are fifteen dollars a bushel, pork is fifty cents a pound, just crape off bacon is one dollar and a quarter per pound, lard the same, butter is a dollar and a half per pound, milk is forty cents a quart, beef is thirty cents a pound. I went to a house to buy a canteen full of milk and the lady told me that some families were starving. Everything was so high that they could not buy it. Many a family is starving in the state of Georgia. Starvation is glaring us in the face. Everything is so high I want you to raise everything you can. A big patch of potatoes of both kinds, and be certain to save every pig you can for it will be a fortune at fifty cents per pound. I want you to have your pigs spade in this month. The new moon. I want you to have the kinder sow spade and the Adkins sow spade and save the others, and do all you can to save all young pigs. If your cows are not going to give no milk, you buy a cow to give you milk. I will send you the money the first chance to pay with. Trade to the best advantage. Don't you sell a pound of meat, dont pasture nothing but the hogs and mare and milk cows. Turn the steers and the calves and that heifer outside. Put one of them bells on Brandy and drive them to the top of the mountai]. Brandy knows the range out there. You must be saving of your clover or it is all your chance this summer for pasture. But if nothing happens I aim to sow the big field in small grain to put all the pigs in it that you can save. I will leave it all with [you] to do the best you can till I come. I want you to kiss my boys for me till I come home. Tell John and Thomas that their pap wants to hug and kiss them both bad. I must come to a close. I want to hug and kiss your sweet lips and I feel confident that I will again. I remain your husband until death. I love you. Sergeant James Parrott wrote this letter from inside Tennessee. Whatever ailment or wound he had seemed to have healed and he had been sent back to the front lines near the Duck River in Middle Tennessee. His 28th Infantry Regiment was getting ready for the coming Union invasion which they knew would appear as soon as the ground dried. The Confederate forces were trying to hold the rich farm lands of Middle Tennessee and the Union forces prepared to seize Chattanooga and drive the Rebels out of Tennessee for good. All furloughs were cancelled in view of the pending invasion. James missed his wife so much and there appeared little hope of their reunion any time soon. However, James was not about to desert. He would stay by his post and witness the heaviest fighting of the war at Liberty Gap, Chickamauga, and Missionary Ridge. am not as stout. I got weighed yesterday and I weighed one hundred and fifty pounds. I got to my regiment this evening and I found the boys generally well, and I hope that this letter will find you and the children and Lety all well and doing well. The most pleasure that I have saw was riding on the train. I want to see you worse than anybody in the world. I thought if I could of had you to fill the seat with me I would of give any mansion, but instead of you it was a South Carolina soldier. I have nothing important to write to you. I have wrote you four letters and have got two letters from you, but I did not look for any answer from you, only the third one. I wrote to you to answer the third one while I was in the city of Rome. I stayed four weeks there after I wrote that letter. I watch the [post] office close. I wrote you a letter and directed it to Gillilands, which is the Oakhill post office. Watch the office and maybe you will get them. I want you to write to me every chance you have, if it is every week. [Send them to] Tullahoma to the 28th Regiment company ___ Tenn volunteers. The last letter I wrote Mr. Goodbar to take the letters to his house, you could get them without going to Gilliland's often. I have got three suits of clothes. I did not know that you would have the chance to send me any clothes. I drawed one pair of pants and one pair of drawers and a shirt. I have enough clothes I think to do me plentiful this year. My shoes is nearly new yet. Ppeople here is in fine spirits. [There] is no talk of fighting soon here. All is quiet now as far as I know. I want to see you all so bad that I can hardly keep from running away. They will not furlough anybody. I dont want to run away. It will be a disgrace, besides a punishment of some kind, but I intend to come home sometime between this and fall, Furlough or not if I can get there. I dream of eating dinner with you and you had a good dinner. It was ham and cabage and chicken and several other things. If that could be so it would be a great pleasuer to me. I long to see the time come when I can get the pleasure of coming home to stay. If I could get one kiss from you it would be more pleasure to me than every thing here. You must excuse my bad writing and all mistakes. The boys is talking to me so that I can hardly write. All glad to see me. I have good friends every where I go, so I must remain your true husband until death. Write as soon as you get this and send it by Jackson. This letter finds James sick. He had left the Confederate main lines near Tullahoma and Shelbyville, Tennessee to a hospital at Tunnel Hill, Georgia. The sargeant was later transferred to another hospital at Catoosa Springs, Georgia. His was most likely suffering from dysentery or chronic diarrhea. This was the most common sickness during the entire war. Also, it was the most common cause of death. The Confederates still hold a line along the Duck River in Middle Tennessee. They are supplied by a railroad from Chattanooga. The Union forces are supplied from Nashville and the Cumberland River. Should the Confederates lose Middle Tennessee they will have given up the best horse farms in the South. The Union forces aim to take Chattanooga and then seize Atlanta. This move would virtually cut the Confederacy in half and paralyze the transportation so vital to the Southern armies. Letter #4 was not dated, but most likely came from the last two weeks in May 1863. I now seat myself to write you again to let you now that I am well and hearty but my wind is not good. I have a shortiness of breath. I weigh one hundred and 55 with my clothes all on and a pair of socks in my pocket. I am as fat as you ever saw me. I have not got fat on a satisfied mind, nor something good to eat. It is a good stomach. I hope when this letter reaches you it will find you and my little boys all well. I received your letters that was dated April 22. I was glad to hear from you but sorrow to hear that my little boys were sick and that you was in so much trouble and that you had worked so hard. I dont want you to work so hard as to hurt yourself. You must take good care of yourself. If you was to get sick and I was to hear of it, it would trouble me almost to death. I will settle with Billy when I come home. The low places in my face is filled out. If you could see me you would say that I was a round face man. If I can I will get my likeness at Chattanooga as I go to my regiment and send it to you. I will tell you my dream the [14th] night of May. I dreamt that little John was dead. It seemed so plain that it troubled me so that I could not keep still and on the [15th] day of May, I received your letters that bare [the] date April 22. I shuddered to read them, but glad tidings that he was alive and on the mend. But I am uneasy yet about you all. You must write to me as soon as you get this [turn the page over]. I have wrote to you time and again and I have never got but four letters from you. I have now thought that you have received all of my letters. I wrote you four in Rome and I got no answer. I have wrote you a letter [that] since I have come to Tunnel Hill the doctor has sent me about eight miles off to a place named Catoosa Springs Hospital. I am in ward number three with about 100 hundred others. This is as pretty a place as you ever saw. They is 50 springs here all of different kinds of water. They are all close together. They are not more than 100-150 yards apart. I do not expect to stay here more than two weeks more till I will go to my regiment. I am expecting a letter from you every mail. If you don't have the chance to send letters by hand to me, send them by mail. Make them at Gillilands and you can get Mr. Goodbar to take them. I expect he goes there once a week to get letters and papers. I want to hear from you once a month anyhow. Direct the answer to this to Shelbyville and be sure to put on the back of your letter to James Parrott, Wright's Brigade, 28 Regiment so that it will be sure to come if the mail is alright. If we leave Shelveyville the letter will follow me. Write to me if you have got my clothes that I sent home and write what all you got with them. I have nothing important to write to you about the war. I learn about ten minutes ago that the Yankees had Vicksburg surrounded. I don't now what will become of us. I expect that we will have to fight before long. Bragg is advancing. If they do not come out I believe that Bragg will attack them in their brestworks. If we do fight, it will be awful. Time I must come to a close. I must tell you about your kinfolks I have found your father's cousin. He lives at Tunnel Hill in Whitfeld County, Georgia. I stayed with him some and he did not charge me anything. His name is Henry Bowman. He is doing well and the master worker. He is a blacksmith I will tell you [my dream] I dreamed that I came home and you and Lety was spining. Lety laughed and shook hands with me and ask me in. I went to you and you shuck hands with me. I thought that I would hug and kiss you [but] you would not let me. I thought you both was so fat that you did not look natural. I can't write half enough now. Do the best you can till I see you, if ever the fear of battle has all left me. Le us trust in God for his kind blessing. I will close by saying I remain your true husband until death. Lety, I received your kind letter. It pleased me much. Lety, I want to see you. I was glad to hear that you was in good health. Part of my dream is so, in the way you weigh 160. After resting I will write on this side. I want to know if Calvin Bowman is in the service. Write how George Speck and family is and give my best respect to all of my friends. Hala Ann, I have learned more since I left home than I would in ten years there. We live in the worst country to make a living than any place. The people is hid bound, no navigation there. I think if I ever get home in peace that I will sell my land and go where I can make a living easier than I can there. Would like to know how ou are doing for salt. You must raise all the pigs you can. They will be needed and will bear a good price. I am glad that you get milk. I want you to raise all the chickens you can. I want to sit by you and eat fried chicken, and you may raise geese too. I have found out that they are good to eat. I have helped to eat a many a gander since I saw you. Wheat crops look well here. I want you to write how Nancy Holloway and Joseph is getting along farming. I want you to engage twenty bushel of wheat when it gets ripe. Get it off J. M. Goodbar if he has it to sell. I want to sow all the field that Nancy is tending. Look for a letter once a month. I will try to rite once a month. I love you and my sweet children. That knot of love that is tied in my heart will [n]ever die. Goodbye. The next letter is the shortest of the collection. In it, James discusses the high cost of living the Confederacy was experiencing since the beginning of the war two years previously. He had not been at home for some length of time because he did not realize how difficult it had become to get salt or leather. As the war progressed, the Confederate forces experienced more and more difficulty in obtaining leather and salt. This letter did not have an address. It is assumed that James is still at the hospital in Georgia. The Union invasion of Middle Tennessee was a mere two weeks away. I have the opportunity of writing you a few more lines. I am well today. I hope that you are too. I render you $14 dollars in this letter. You must write to me if you get it and write soon. I would send you some money before now but I had no chance by telling it. I have spent write smart. I have drawn 62 dollars in all. I spent it for something to eat and it was high. If you need more money than this write to me and I will send you some more. I want you to lay in salt if you can, and leather. Write how your are doing for salt. I must close by saying I want to kiss you. This letter was written after James Parrott had returned to his 28th Infantry Regiment near Shelbyville, Tennessee. General Bragg is trying to instill discipline into his troops before the coming Union invasion. You will read of an execution for desertion. General Braxton Bragg required all of the 28th Regiment watch the execution in order to leave a strong impression on the soldiers' minds. In less than two weeks the impending invasion would come. This time the Union troops had a surprise for the 28th Regiment. The repeating rifle would be used for the first time in a battle. The Southern troops would say the Yankees "had a gun they could load on Sunday and shoot all week." Letter #5 also includes the names of several men who served with James Parrott. I take the opportunity to drop you a few lines to let you know how I am getting along. I am well and hearty with the infection of a cold that I have taken. I got back to my regiment. I truly hope that this will find you in good health and doing well. I want to see you and the children awful bad. I think of you every hour in the day and dream of you more often when I sleep. I have nothing very important to write to you. Only a few nights ago we had a tolerable good camp meeting. 13 mourners and 1 profession [took place]. I will tell you of a sight that I saw the 12th day of this month. I saw a man shot to death with muskets. He was charged with desertion. The brigade was all ordered to the field where he was shot and then the prisoner was brought. They sung and prayed for him. He said that he was prepared to meet his God in peace. After the prade they then took him and led him to a stake and tied him and 12 guns was discharged at him. Six was loaded with ball and six with blank loads. He would not let them blind his eyes. General Marcus Wright said that he never saw as gallant a fellow as he was. General Wright shed tears when he shook hands with him after he had tied him. The man's name was Wright, who lived in Jackson County. He belonged to the 8th Tennessee Volunteers. Eenough of that. Hala Ann, I sent you 15 dollars in money by Mr. Hampmiller, and a letter. I trust you will get it. I have been working in the breastworks today. We are building breastworks here. Our breastworks is about 15 miles long. Some think that we will fight here and some thinks that we will not. I heard good preaching yesterday. We have tolerable plenty to each such as it is. Myself and my mess went out yesterday and picked us a big mess of wild salad and it was not bad to take. I eat a big [helping] of it and today I eat a big mess of bread soup. I am a good hand to make it and I can cook tolerable well but nearly everty time I go to wipe the skillet out I burn my littler finger. I have just as good a mess as in the 28th Ridgment. I mess with Nathan Callahan, Thurstan Qualls, John Ford, M. T. Ray, Bailey Copeland, John Jackson, and Jerry Holloway. They all seem like brothers to me. We have moved from below Shelbyville. We moved about 5 miles north of Shelbyville. Well, you must write to me soon and direct your letter down and see me. If I dont get to come home, which I see no chance now, if you could make the [arrangements] so you could leave home, you could come down and see me and get back in 10 or 12 days and two or three with you would be more satisfaction to me than everything that I have saw since I left home. Tell Nancy that Jerry is well. He is gone out in the country to buy some milk now. My mess is all well. Give my best remarks to all my friends and keep a reasonable portion to yourself. I have nothing important to write to you about the war. You must write every chance you have as you promise to do, for I would like to read a letter from you every day. Write all about our affairs, how corn looks, potatoes, and wheat. I always love to read as kind letters as you send me that lets me know that you are living a christian. I must bring my letter to a close by saying I love you and my children better than everything else in the world. You must kiss the boys for me and hug the baby. Bless his heart. I want to kiss him. I know that he is sweet by his being so fit. No more - I remain your husband until death. Good by for this time. This letter was written one week before the Union attack on the Duck River line. Unlike the Union Army, the Confederates are required to grow their own food. James wrote of having to sow wheat with the other men of his company. The lack of money at home required a barter system. James also tells his wife how to settle old debts back home. I have another opportunity to send you another letter as I have promised to write every chance I have. I intend to do so and I believe you will too. The best news I have to write to you is that I am well and I do truly hope that this letter will find you and the children all well and doing as well as could be expected. I want to see you as bad as ever but it did not fall to my lot to get to come home this time. As I had no wheat sowed I did not get to draw straws with the boys. The detail was so scattering, only five men from our company, but I hope that I will get a furlough before long. If anything should happen that I should not get a furlough and I stay here, you must come and see me if you can. I have drawed a short coat and I have sent my coat home by John Hancock. He is to leave it at Mrs. Timler and I wrote you a letter and sent it by mail that I put a paper of five needles in it. I want you to write if you have got them are not. I want you to be contented and dont grieve for me. Grief don't stop this war nor does it cook you breakfast nor your supper. I feel confident that I will see you again. I want you to weigh all my boys and tell me how much they weigh. I want you to have some of my old sows spade if they are not with pigs. Have the Adkins sow spade and the Kiner sow spade and the sow that I bought of Nancy Their big sow and their two gilts will be enough to keep til I get home. I want you to save all the hogs you can. Write to me how all the stock looks and how many hogs you have alive. Let nothing run in the clover but the hogs and mare. Let the cattle all run outside but your milk cow. You have no harvest pasture and your clover is all your chance for your hogs. I want to know how your corn in holding out and your bacon, and how you are making out for salt and write who is your best neighbor. If anybody mistreats you, I want to know it. I want you to write how our corn looks and how much ground is lying out. If old Barney West can be got in to work, I want the floor put in the new house. That house must be fixed before winter if any probable chance. He owes me the putting in the sleepers and stocking my briar scythe, and the building of my chimney. Tell him if he will put down the floor and stock the scythe that we will be even. I must close by saying I want to hug and kiss you my lovely wife and my sweet baby and hug my big boys. Goodbye for this time. 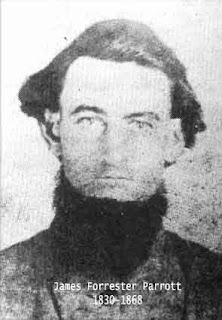 On November 27, 1862, James Parrett enlisted in the Civil War. He joined Company H of the 28th Tennessee Infantry at McMinnville and achieved the rank of Sargent. A collection of letters that James wrote to his wife, Mahala, during the war were handed down over the years and eventually became the property of Doris Parrett Williford, James and Mahala's great-granddaughter. The letters chronicle the inner struggles James experiences while being away from his wife and children during the war, and how he uses his faith to see him through the ordeal. This letter was written after the fall of Atlanta on September 4, 1864. Both armies had fought almost non-stop for a total of four straight months on the road to Atlanta. James Parrott reflected on his good luck and the blessing of God in protecting him from harm. The tenor of Parrott's voice showed his war weariness. I have the opportunity of seating myself to write you another letter to let you know that I am well and I hope that this letter will find you and my sweet little boys and Lety all well, and I hope that this will find all the rest of my kinsmen and friends all well. I want to see you all so bad that I cant hardly stand it. I hope and trust to God that the time is not far distant that I will get to come home and live in peace the remains of our days. May God speed the time. Dear companion, I can say to you that I have been in all the battles since the battle of Murfreesboro and I was in the battle of Chickamauga and at Resaca and at Darsville, New Hope Church, Kennesaw Mountain, Peachtree Creek, Stone Mountain and at Jonesborough. I have been in all those battles and through the blessing of God I have never been touched with a bullet. I thank God for it. God has been my shield and I hope that He will be until I die. What has been the cause of him being my friend - I have ask him for his blessing. You wrote to me that you had prayed for me. I do believe that God has answered your prayer, for he has blessed me in everything, and I request you to continue to ask God for to extend his blessings toward us as a family. If we shall never see each other again in this life I hope that we will meet in heaven where there is no war but peace forever. Tell John and Thomas to be good boys and mind their mother till their pap comes home, and to learn to read and to spell. I want to see you all so bad that I cant hardly write so that you can read it. You must excuse all mistakes and bad writing. I want you to kiss Robert for me and tell him that is from Pap. I want you to write to me just as soon as you get this, or as soon as you can, and write to me about how you are getting along and all about how my friends is getting along, and tell them to write to me and give me all the satisfaction you can. Mahala Ann, I have wrote you two letters before this one. I sent them by the way of Richmond, by flag of truce. I am fixing to start in the morning through the lines with a flag of truce to exchange prisoners and I expect to send this letter through the lines by some prisoner and get him to mail it. When you write I want you to send me some United States stamps, and when we get a communication open I want you to write once a weak so I can get them regular. I want to know if the mail route is open to Gillilands at the Oak Hill Post Office. I send my letters to Burkesville, Kentucky, in care of Alen or Olen Gilliland. Inquire for letters every chance you have. I saw Elvin Moredock sometime back and he said that he was writing home. I want you to get Uncle Thomas Moredock to look for my letters and get them to you. I aim to write every chance I have as I can't get to see you. I hope to hear from you. It would do me more good to hear from you than anything else as I can't get to see you. I oft times think of that sweet babe that I kissed the morning I left home. God bless his heart. I want to kiss him today and you to. Hala Ann, I want you to pray for me and tell all my Christian friends to remember [me] in there prayers. Pray to God to give us peace and stop the sheding of blood. Governor Brown of Georgia has set Thursday the 15 of September for fasting, humiliation, and prayer. I hope it will prevail much. Dear wife I shudder to think of your troubles when your little children asleep you are awake. I am in this war. I don't know when I can get out of it. You had rather have me a brave man than for me to be a coward. Wife, you do not want me to run risks of coming home and take [protection in the wild]. I could write a great deal more but I am not allowed to, so I must close by saying I remain your husband until death. Goodbye for this time. Lety, I want you to write to me and tell me who is your sweatheart. This letter is pretty much a repeat of the conclusion of Letter #8. James further reflects upon his good luck and blessings from God. War weariness again crept into this letter. At the time, both armies in Georgia were taking a much needed breather. General John Bell Hood had lost Atlanta, but was certain that Union General Sherman had traveled too far from his base of supplies at Nashville. General Hood planned on traveling northward to cut the railroad between Sherman's Atlanta-based army and the main supply depot at Nashville. This would have caused Sherman to retreat back to Nashville and give up Georgia and Middle Tennessee. Anyway, that was Hood's plan. I, this sabbath morning, seat myself to write you one more letter to let you now that I miss the land of the living and well, and hope that this will reach you and find you and my sweet children all well and doing well. I want to see you all powerful bad. I want you to write me as soon as you get this and give me all the satisfaction you can and send me some United States postage stamps, for I want to write to you often if the communication can be open. I have been in several hard battles, but through the blessing of God I have never been touch with a bullet. God has been my shield and I hope he will be till I die. You wrote to me that you had prayed for me. I believe that God has answered your prayer. I want you to still ask God for his blesing and tell all of my Christians friends to remember me in their prayers. I am not allowed to write much. You can write to me all about your affairs. I have to close. Direct your letters to Chatham Division, Wrights Brigade, 28 Tenn. Regt. So, I remain your husband until death. Kiss Robert for me. Tell John and Thomas to be good boys till their pap comes home. Good by for this time. On November 30, 1864, James was in the front ranks in the attack upon Union positions at Franklin, Tennessee. He was shot in the lower right foot breaking the metatarsals. James was left at a Confederate hospital while the rest of the army went on to Nashville. After the Confederates were routed at Nashville, Union forces captured James around December 17, 1864. His foot was amputed by Union doctors on December 26, 1864 at Nashville. He was sent to a prison in the Louisville on May 6, 1865. On June 16, 1865, he swore to the Oath of Allegiance and was paroled. After the war James and Mahala Ann farmed in the Rock Springs area of Overton County. James created his own wooden leg. He made it a habit of tying it to the saddle of his horse as he rode. On May 6, 1868, the horse came back to the house alone, with his wooden leg still attached to the saddle. The family found James dead from a gunshot wound. He had been murdered. Suspected of being the murderer, Mahala's brother disappeared the very same day and was never heard from again. James was buried at Officer Cemetery. Mahala never remarried. She died in 1908 and was buried beside her husband. This concludes The Parrett Letters. Country singer Jack Barlow has died at the age of 87. Barlow passed away Friday, July 29, after a battle with a lengthy illness. His success in the music business began in the 1960's. Between 1964 and 1965, Barlow co-wrote three songs with my father. They were produced by the legendary Buddy Killen and released on Dial Records. The first of those releases, ‘I Love Country Music (But I'd Rather Fight Than Switch),’ which made it to #21 on Cash Box the week of September 28, 1965. Barlow sang the song on the stage of the Grand Ole Opry on November 8, 1965. The song was a take off of the Tareyton cigarette commercials, which featured men and/or women models sporting a black eye and delivering the line "I'd rather fight than switch." The songs that dad co-wrote with Barlow were produced by the legendary Buddy Killen. The flip side of the record was another of the songs that Jack co-wrote with my dad and others. It was called Number One In The Nation. Barlow's second single release with Dial Records was Dear Ma. Side B was the third and last collaboration between Barlow and Speck, I Love Her Still, as in "I don't care if she's a moonshiner's daughter, 'cause I love her still. Barlow got his start in entertainment as a radio DJ after serving in the Navy during WWII. In the 1970's, he switched creative gears a bit, penning jingles for the Big Red brand of chewing gum. He also continued to traffic in the food and beverage world, taking on voiceover work for a panoply of corporations like Dollar General, Kraft and Kellogg’s. He also did voiceovers for car companies like Chrysler and Dodge. 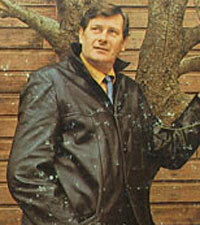 Barlow is survived by Dianne, his wife of 24 years, along with several children and grandchildren. A public memorial for Barlow is scheduled for August 13, from 5-9PM CT. It will be held at Harpeth Hills Memory Garden Funeral Home, which is located at 9090 Hwy. 100, Nashville, TN, 37221. I Love Country Music also had live with another recording artist. Rockabilly legend Hayden Thompson of Booneville, Mississippi, just a few miles north of Tupelo where Elvis was born, recorded a 45 r.p.m. record, a cover of Junior Parker's Love My Baby, at the legendary Sun Records in Memphis. But, his timing was ill-fated as interest in rockabilly was beginning to fade in favor of 'newer' sounds. So, in 1958 Thompson moved north to Chicago. to Chicago. In the late summer of 1965, Thompson walked into WJJD-Am in Chicago and recorded two songs. Side A was I Love Country Music (And I'd Rather Fight Than Switch. Side B was Ain't It Funny How Time Slips Away, written by Willie Nelson, which turned out to be one of the all-time classic country hits. In 1986, the two songs were included on an album Hayden Thompson released on SunJay Records, entitled Early Days. Dave Travis, who wrote the liner for the album said, "The Willie Nelson classic could almost have been a 'Sun' cut as could the "Hot' side "I Love Country Music," where (Johnny) Cash would have been proud of the sound." The songs were "forgotten about" as the album liner says, until years later when Hayden included them on the Early Days album (SunJay 1986). Thompson took a break from music for a while in the 70s and went to work for driving a limo. When he discovered his rockabilly songs were big overseas, he went back into music and headed for England for several appearances. Today, Thompson lives in Chicago with his wife and occasionally performs.